This is 5XG Studio presenting Project BlockchainZ, the game prototype we are working on. It's a Third Person Shooter video game with RPG and Real Time Tactics mechanics in a post-apocalyptic world where the survival of the human kind depends on you. First of all, let us tell you what is this prototype about, what's the storyline behind the curtains. Nobody could imagine the falling of the whole world until the deaths woke up. That nonliving ones became something we cannot consider as human being. They changed into a new creature, stronger, more frightening, and almost unbeatable. Society broke in pieces and the few ones alive had to survive at any cost. 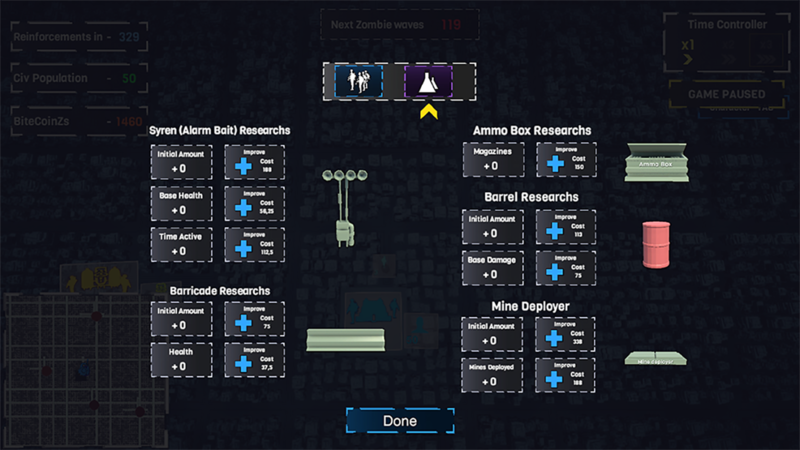 There’s only one way to kill the damn zombies: the BlockchainZ Ammo. 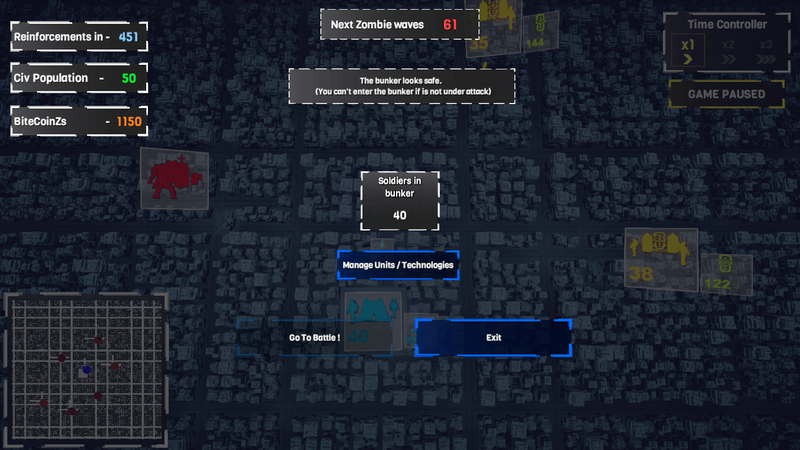 Search for the BlockchainZ Ammo and destroy the hordes of zombies, but beware of the raiders: they will take your BlockchainZ Ammo whatever it takes. Right now the Raiders have all the BlockchainZ ammo, you must fight them and spoil it, but be on guard, they will counterattack. Remember, the survival of the people depends on you. Don’t let them down! 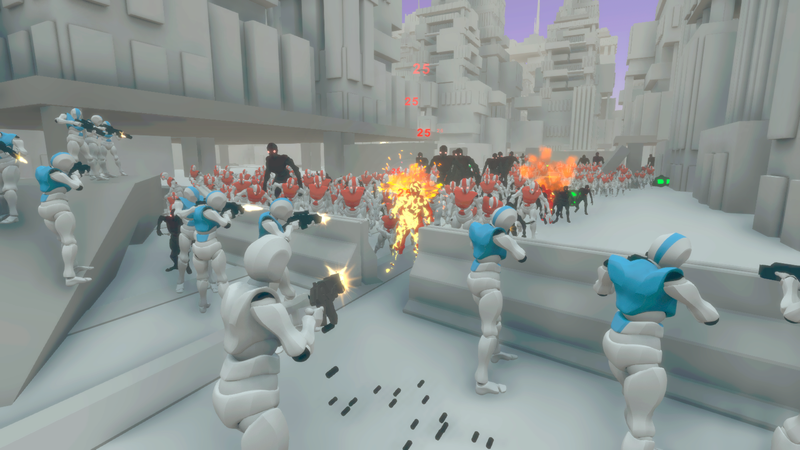 Once you start playing Project BlockchainZ, you must defend the bunker against the hordes of zombies and raiders on a fixed map where you'll fight with your troops and traps. The bunker is basically the main area where you'll not only have to keep the people within alive, but also yourself during the reinforcements arrive. Well, yeah... and now you might say: why is it called BlockchainZ? Just because the zombies are extremely resistant, so you will need a type of ammo called BlockchainZ, which contains a very strong poison that acts directly against the brain traveling through the body. It's just a code name, alright? We have some ideas about the fresh new name. So, continuing with the gameflow, the BlockchainZ Ammo is hidden in Raiders Storages and you must spoil it from them. The more B-Z Ammo you spoil, the more Raiders will attack you, increasing the game difficulty level. Tactical map to manage your troops across the battle. Deploy defensive elements to direct the action where you want. Post apocalypse - scify style. 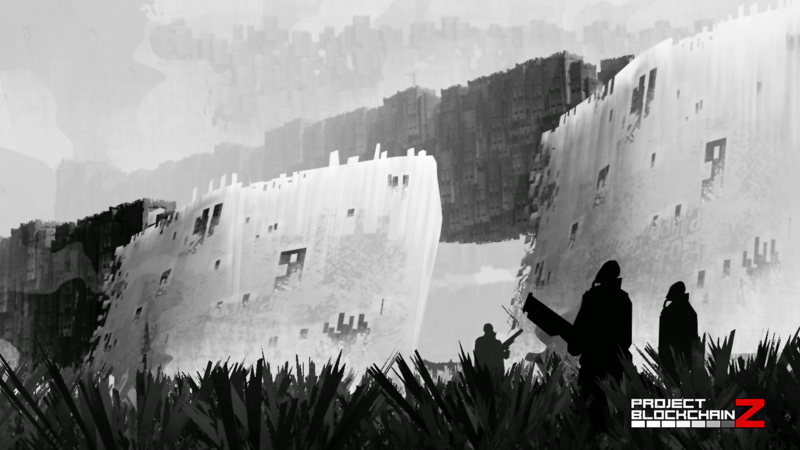 This video game is like a big blank canvas. Right now, we really need the community feedback in order to get a good balance in the gameplay. So, we will update this thread to show you our improvements. Hope you download Project BlockchainZ and enjoy playing it. Any suggestions are always welcome. Thanks for all the support! 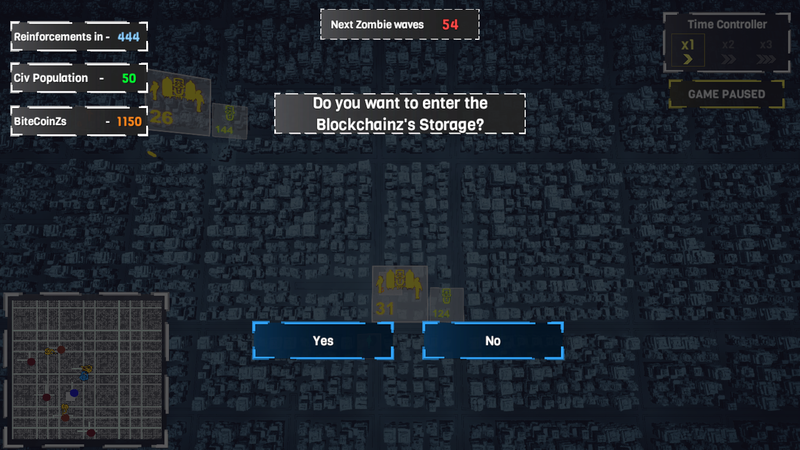 If you feel capable to kill zombies, do not hesitate and download Project BlockchainZ. And remember, you can be our ally on Discord Official Server. Far away in the future, the world has fell down and there’s no hope for the hopeless. Society is completely broken in pieces and the few humans alive try to survive at any cost. The whole planet is crowded of buildings burned to the ground. Cities have just became into ruins. But we are not alone. This is not our world anymore. We are sharing this shattered planet with something we get used to calling the dead ones but they are not now. That’s the word we try not to tell. Because that simple meaning do freeze our breaths. They are not just ordinary zombies, like movies always claimed. These creatures are stronger, incredibly resistant and very, very frightening. Just imagine for a while that you meet with something extremely capable to kill you. What would you do? That’s the only purpose of the life. And there’s only one way to kill zombies: BlockchainZ Ammo, a type of munition especially made to kill living dead, based in a very strong poison which attacks the zombie brain. You must protect the bunker until the reinforcements arrive. You have to kill whoever and whatever attacks you. People protection depends on you. You must clean the key places infested by zombies. You need to spoil as much as Bz Ammo as possible to the raiders in order to kill the living dead. But remember: raiders will counterattack. Be careful with the hordes of zombies. Once they arrive, there is no way out. I like the white aesthetic. Very clear and confortable for the eye. Got a Discord to suggestions and bugs? wanna help. Yeah! Find us on Discord right here. Any help is welcome. Clean up the zombie-infested key areas. Anticipate your enemy attacks and intercept them at some point on the map before reaching your bunker. Get ready to think as quick as possible. The hordes of zombies and the attacks of the raiders are very fast. 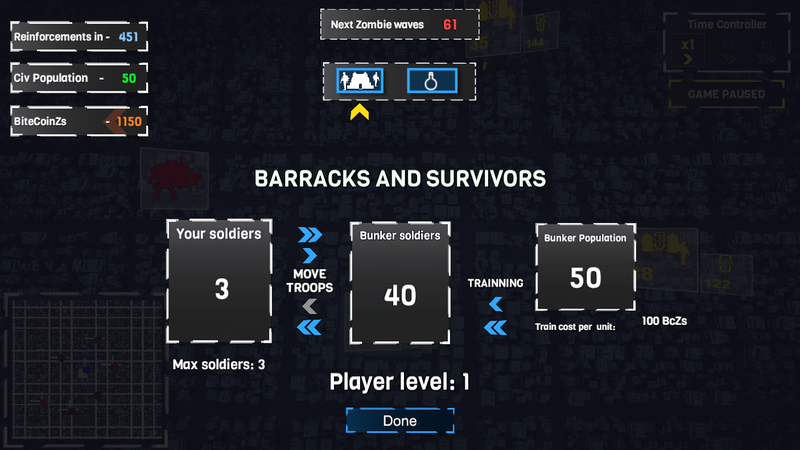 With the help of the Tactical View, as a player and also as the Captain of the soldiers’ platoon, you must array your troops to the victory. Command your soldiers to any position in the battlefield and be the leader the world demands to be saved. 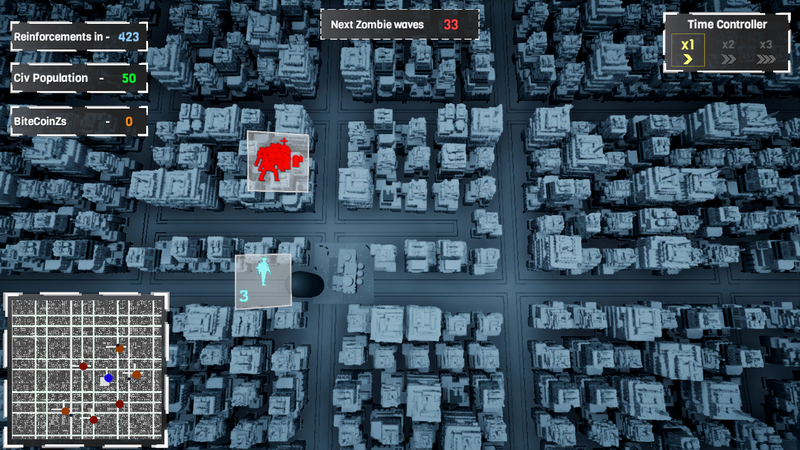 Destroy the zombie tombs inside the hatches and so you will stop the hordes of zombies. 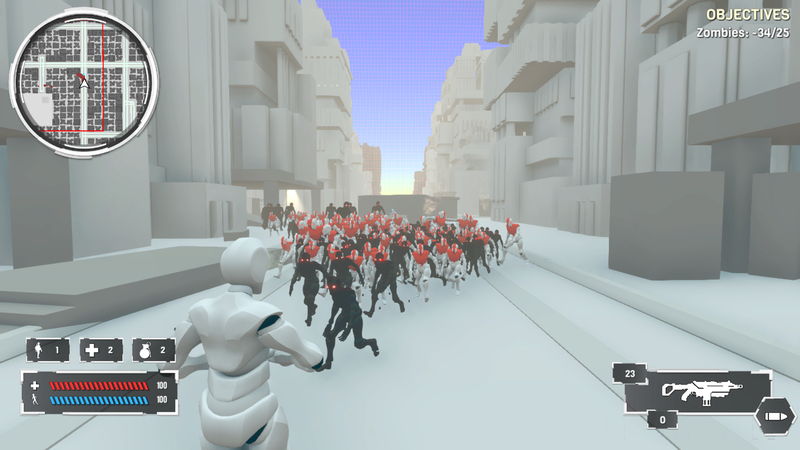 In Project BlockchainZ you will fight in a procedural map where you can find different goals managing the whole action strategically. This procedural map will be your Worldmap. On the top left corner you'll see how long will reinforcements take to arrive at the bunker. Also, you will notice how many civils are inside the bunker and how much BitecoinZs do you have to spend in the technology's store. 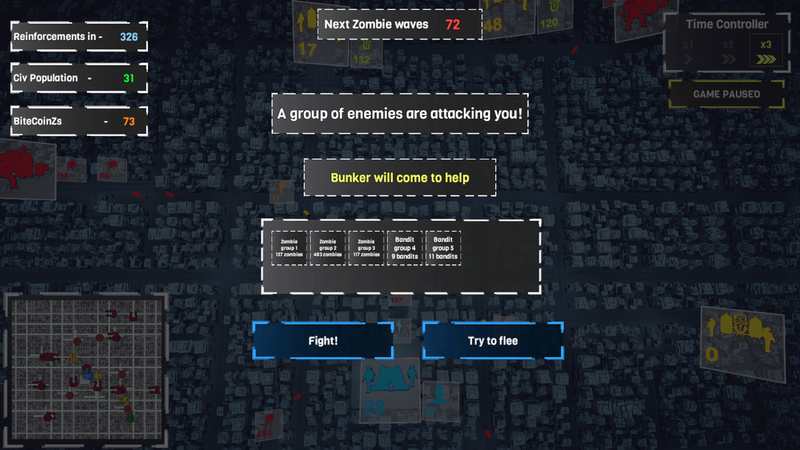 In the middle up of the screen, there is an alert about when will the new zombie wave attack the bunker. Time Controller is for the speed while moving across the worldmap. Finally, there is an small world map on the left bottom corner where you will notice all the events around the worldmap. The Bunker. The place where you can manage your soldiers, train them and buy some technologies. These technologies will be to improve the character skills and so create a better battle gameplay. Zombie Hatch: it is formed by zombie tombs (remember: we are still thinking on the zombie idea and what kind of creature could fit better in the story). If you destroy the zombie hatch, no more zombies will appear from this area. Raiders Storage: it's where the Bz Ammo are. You can spoil it while fighting against the raiders or defeat them directly and so you'll get the Bz Ammo. Raiders encounters: sometimes you will be find some bandits across the battlefield. You can try to flee, but sometimes you won't. If you decide to fight against them and finally defeated your enemies, you'll earn BiteCoinZs. 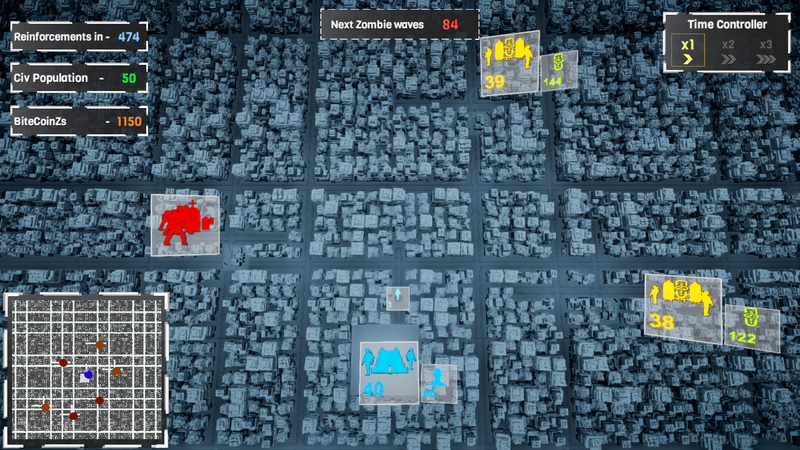 Zombie waves: the worldmap is crowded of zombies walking around the streets and ready to kill you. Kill them and win not only experience, but also BiteCoinZs. Raiders with hostages: defeat the enemies and you will rescue the hostages. These civils will go directly to your bunker. Through the Worldmap you will manage your troops and enjoy all the RPG attributes like the troops training, all about buying elements to use in the battlefield and much more possibilities. In the worldmap you will be capable to manage the challenges of every battle in order to success. There are some technologies at your disposal. You can buy them with the Bitecoins you earn in the battlefield. [BzLog 6]: Wanna kill zombies cooler? It's Bullet Time! Sometimes happens. You feel like the most incredible hero around the world ready to command your troops against the hordes of zombies. This is something you are already feeling. Because deep inside of your heart, you know there is a leader capable to do whatever it takes to keep your people alive. And that's why Project BlockchainZ exists, to provide you the weapons and troops to save the world. But remember, we are just a concept game, so first we need you to save the bunker in order to save the world. This bloody bunker is crowded of helpless people, desperate to survive, and you are their last hope. Be a soldier, be a captain, be a hero, be a damn zombie killer! No matter how you name yourself, just shoot them all! And please, don't let them hurt you. As a leader, you have the responsibility to command your troops and arrange the soldiers. Every single order matters. Do your strategy, do it quickly and do it for your people. Get ready for the worst enemy in the whole world: zombies. And use all the weapons at your dispossal. Everything counts. Gun. Very agile and really useful when you have no riffle ammo. Rifle. Your beloved weapon right now. Aim, shoot and reload! Shotgun. Wanna kill zombies cooler? We've just included this weapon because you deserve it and zombies too. Grenades. Zombies are everywhere! Just throw it out and see what happens. Because we know you are in the middle of the battle and zombies are getting closer, you can use a better ammo to kill them all: BlockchainZ Ammo, aka Bz Ammo. You gotta spoil it from the raiders supply depot. Right now, we are thinking of new weapons to be included in the game. Something to throw grenades farther (does anybody say bazooka? ), but not extremely powerful to kill zombies, because of the game balance. Remember that for now this is a scifi video game and we are still discussing the lore behind and so the graphics. That means we are open to new ideas. If anybody has an idea about a new kind of weapon, just let us know! You can comment here and talk about it in our Discord Server. Feel free to participate, this blank canvas game will be awesome thanks to you! 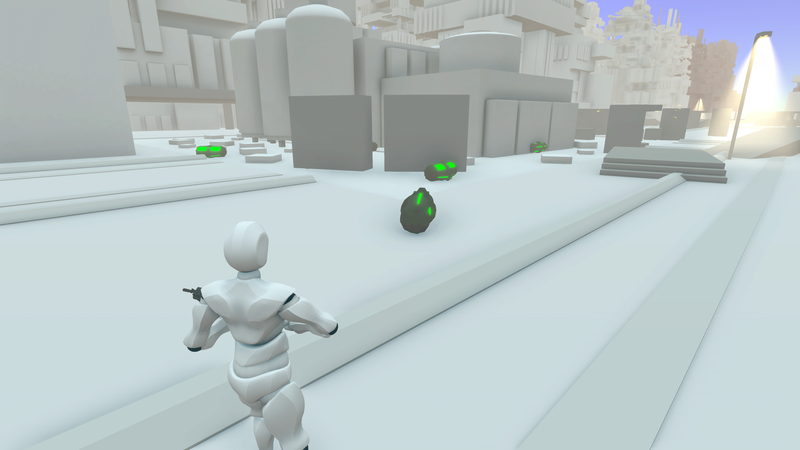 As you might know, Project BlockchainZ is a concept game and it works as a big blank canvas to create a much more interesting game. These days we've been working a lot in the concept of the environment and the city where the game take place. When we started developing the video game, we had the idea to create a huge city completely ruined by thousands of years of struggling. It would be a desolated scenario to play. 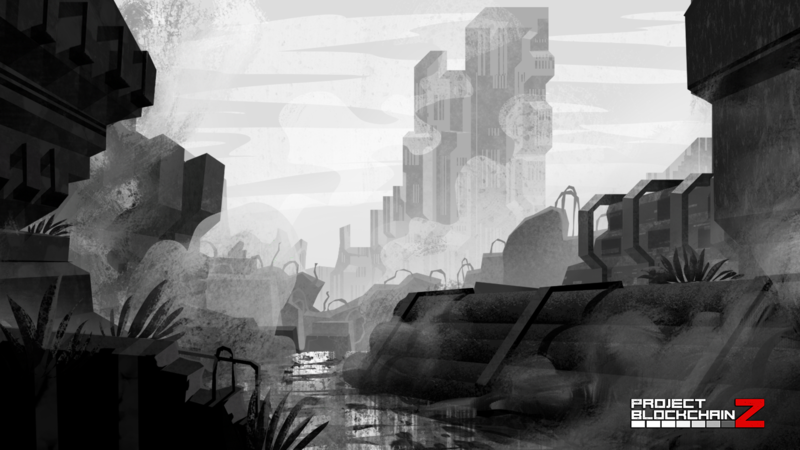 We believe the city will improve the concept of the worldmap, and the player will experience what means to walk around a place devastated and crowded of terrible menaces. We're talking about a moment far in the future after of centuries of conflict when people have no hopes, no dreams, no food. And not only because of the nature's cruelty, but the human malice. 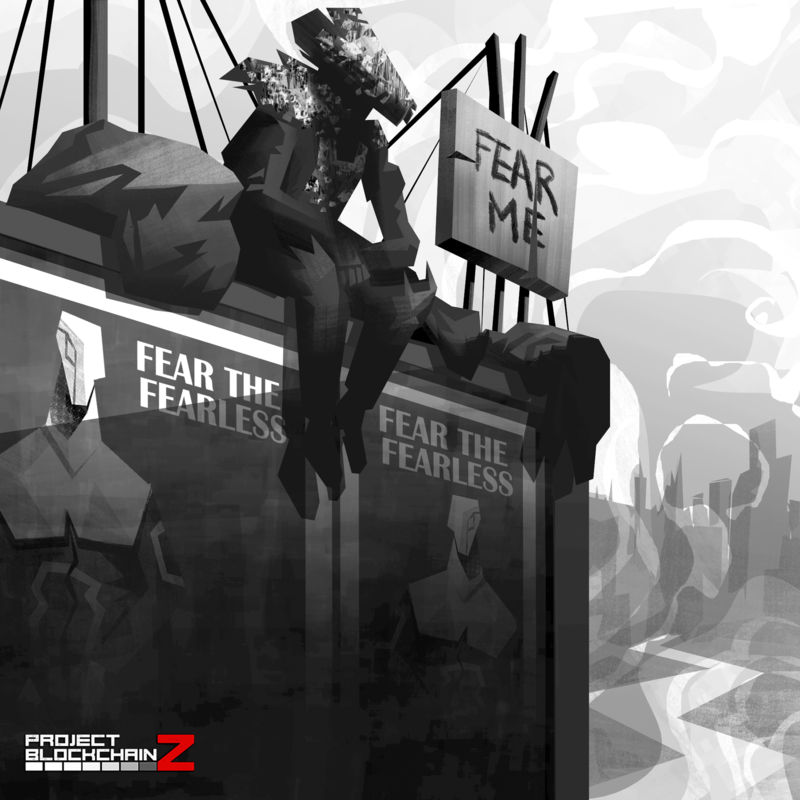 This mega city will be strongly divided in factions and parties, and not only the zombie becomes a menace, but also those who are supposed to be on your side. We are working so hard in the identity of every faction. Confrontation among factions in a shattered world, a place to die, a battlefield. Seems like a pretty cool idea, it will be plenty of inhabitants, some enemies and others that might cooperate. One of the most important things we imagine about a post-apocalyptic world is to understand the desperation and also the complete desolation the few people alive could ever feel. It's our main purpose to create this devastated environment in order to enrich the idea of the inhabitants. And we really want to develop it with you and all the community and of course share the improvements each week. What do you think about this concepts? 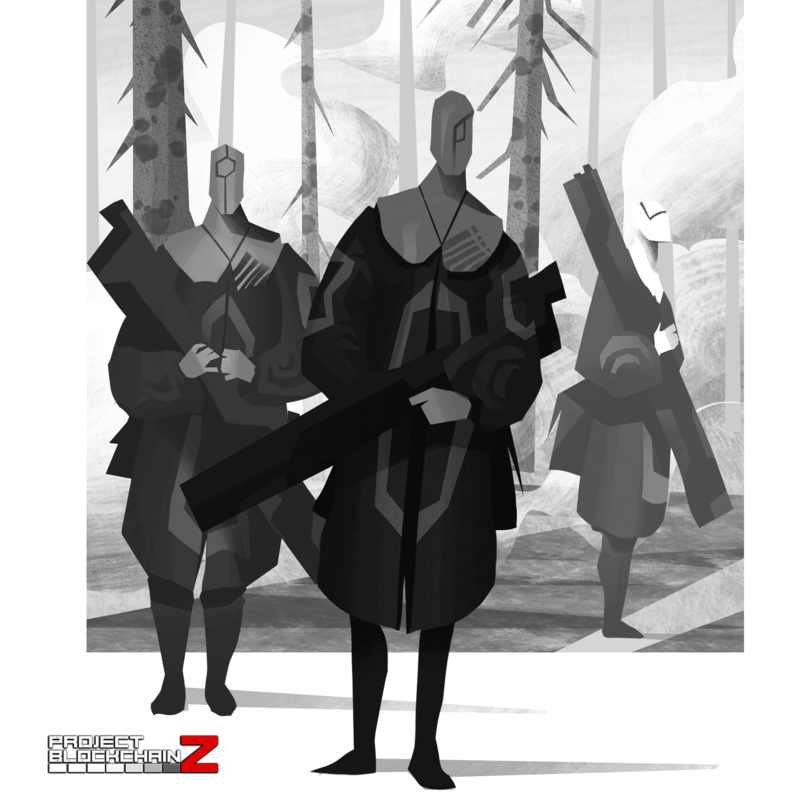 How do you imagine each faction in this ruined world concept? Remember that we are still working on the zombie/monster idea, and we want to develop a new kind of creature that you might love. Anyway, don't forget to give us some feedback! All suggestion are welcome. Wanna try to save the bunker? Let's download Project BlockchainZ! Feel free to participate in our Discord discussion! [BzPatch 2]: Updates and improvements! New Patch is here! Say hello to Patch 1.0.2b (Patch notes below) A new update with nice improvements for a better game experience. Firstly we have reworked so hard the AI, so now they will react much better to the different situations, more work will be added, like advanced behaviors, different animations and there will be more in futures patches! Also we've done optimizations in the shooting feedback, first we add some shake to the camera. 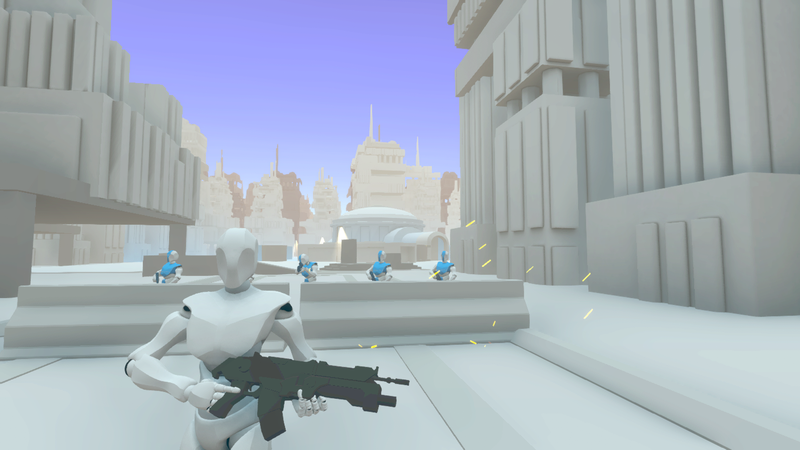 Also we have been working a lot in the IK stuff so when you shoot the gun move the character's arms and shoulders. And we have changed nearly all the SFXs for a more interesting version. Give it a try, you will notice with the first shoot. IK is the acronym for Inverse Kinematics. IK is an animation technique that allows much more responsive animations in games. You'll see that now the difficulty level is a little bit more harder (We also took out rookie level), because we want the video game to be a really interesting challenge for every zombie killer. Nobody said that killing zombies was easy. The real challenge is to survive until your reinforcements arrive. Finally, and not less important, we have corrected some nasty bugs! Are you capable to save the bunker? Prove it and save the world. PSD. : we are still working on the story. 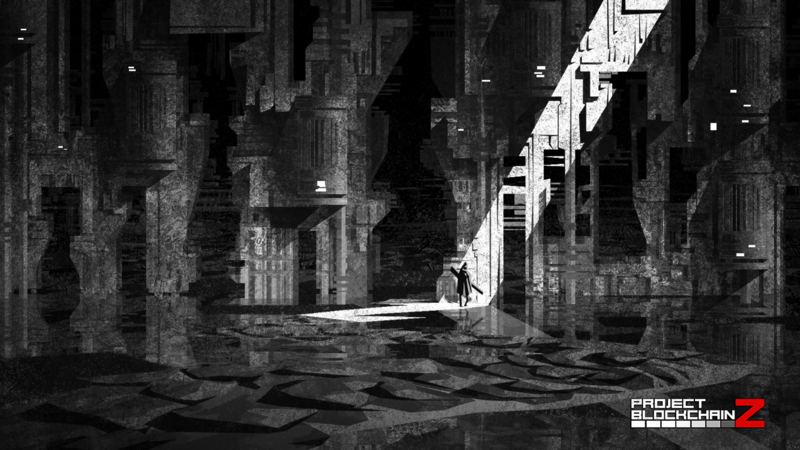 And now we are so happy to show you some of the concept arts we have prepared. What do you think? Let us know on our Discord Server. General improve on AI, now the bandits reacts much better. Big optimization in shooting feedback. New SFX for each every weapon. Now the foots adjust to the terrain. The character reacts when is hitted. Not the zombies let some space after attacks. Now the challenge level includes the difficulty. Challenge level adjustment in order to create a more interesting challenge for the player. Fixed some related bugs on AI. Aiming by the left is temporarily disabled while improving the character's IK. Now you can't train the last civilian in the bunker. Fixed the bug related to the updates, now it works fine. 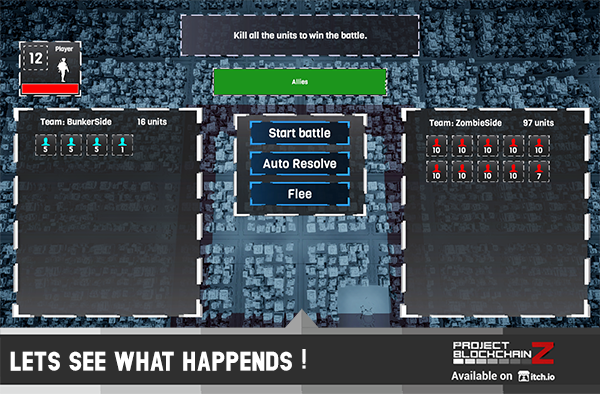 Additionally, we are working on the auto-resolve feature that let the easy battles be done without wasting time Eg. when you have 20 soldiers and fight against 3 raiders. These kind of battles have no sense at this point, so we believe player doesn't need to waste time them. Just focus in the good ones. Once we have this feature totally balanced and tested, we'll update it in the next update! We really hope you enjoy these new improvements. If you find any bug, please tell us right here or through our Discord Server. Thanks a lot for all the support you are bringing to us. It's great to know how do you feel about Project BlockChainZ. It's nice to see you again. How was everything going on? We are so glad to show you our new fresh Patch, 1.0.3b is ready to be downloaded for all of you, avid zombie killers, courageous trigger-happy soldiers. This Patch is full of improvements, notes about bugs solutions and a few surprises just to drive you crazy like a zombie holding a brain. Are you ready to find out the latest features and improvements for Project BlockchainZ? Shut up and dance with zombies! Just because we know how important is the feeling of being a zombie, we have reworked the Reactions, so these noisy hungry creatures will react better to different situations. It means the undead will not only find the best way to rush over you, but also throw to the floor and feed your body once they kill you. And you will be the bloody witness who presence this pretty carnage, whether you have set the highest quality options or the lowest, thanks to the new performance mode in the options menu which is intended for low systems (Will reduce the number of enemies, but they will be a bit harder)s we have included, with only pressing one single button in settings. But please, do not worry about the zombie attack, because right now your soldiers will shoot them with no doubts. Unlucky, raiders will do the same to you, too. Say thank you to the improvements! Don't forget to run away from the enemies, if they are destroying your defenses. Just run like a gazelle would do, trying to scape from the clawns of the lion. But remember that stamina last only so long for a single run, and after that, you will run slower, of course. But not the zombies. So, take a cold head to recover the breath and so stamina in order to think your next step. We have balanced difficulty level, as many people asked us, and now Commander level is activated, or what people get used to calling the crazy level. Because you are all allowed to kill zombies, whatever the experience you have. And talking about the difficulty range, we have a new feature for you, guys. We believe there is a chance to include a new weapon, something to kill enemies far away from them. Say hello to the sniper riffle, our new pretty toy which gives you the opportunity to kill your targets, no matter how far they are. Just by pressing the middle and right buttons mouse , you will aim your enemy. Do not hesitate: just shoot! It's free! Now you will have normal speed in bullet time, take advantage! Time is important , lets the soldiers auto resolve the battle! We know sometimes the smallest battles are a bit annoying. They aren't funny, because of these we include the auto resolve option. But careful! your soldiers without your expertise will have much more casualties. Take that in account and let them fight for you sometimes. 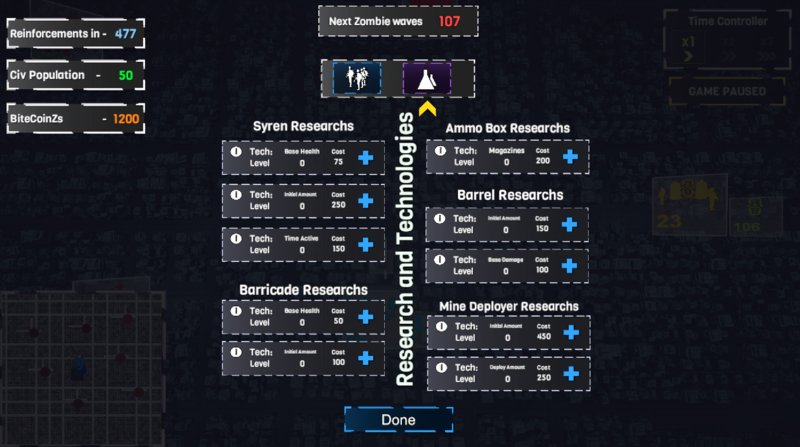 What happens with the technology research system? Yeah, we know. It's been a little bit hard to understand how it works. Many questions about how to increase the initial amount, or how to upgrade the technologies for a better use. We've been working on it, so now you will see technology researchment dashboard more suitable and clearer. 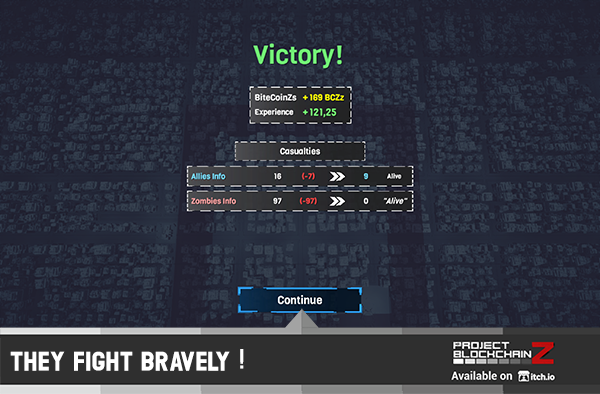 Besides, we have improved the Battle Mode Hud, in order to give a better feedback when the player wants to build a technology. We want you to build things easier, and we truly thing now it's gonna happen. But, if you have any further questions or any suggestion, please give us feedback right here and join us on Discord. We are so open to discuss about it. What makes the player enjoy the game, becomes important to us. We are making great strides with the gameplay storyline. Now you can read the whole story of The Soldier Book in our Discord. Besides, you will see a few concept arts about the city environment we are developing and also the factions we are trying to include. Remember graphics are still not set, but we have something special working in progress: right now it is called V2, but it wil be our next step in the prototype evolution. This V2 will contain new graphics, a lot of new features, huge improvements in the worldmap, with new events and situations to play with, and of course a few story behind. This story will be a small step in the massive challenge we are facing: an amazing story that blows your mind and freaks you out like a spark in your brain. We will share every single step of V2, the next prototype for Project BlockchainZ. So, go for Discord, V2 will worth it! Quality optimizations for low pc systems. SFX improvements while winning or being defeated. Huge optimization in Start Menu. New auto resolve mode, that will avoid your some annoying battles. AI improvement for soldiers and raiders: now they don't stand for some time looking at the enemy withouth shooting. AI improvement for zombies: they find better ways to go over you, and also throw to the floor to eat you when they kill you. Stamina improvement: you run slower when stamina has been spent. Bullet time improvement: now player and bullets act in regular speed while everything goes slower. New weapon: sniper riffle with telescopic sight. Fixed some bugs related to battle mode. Big optimization on building feature with new iconography for a better user experience. Fixed some bugs related to Bz Ammo amount. Fixed bug with zombie tombs health bar. Now they appear again. Soldiers spawn in the correct places. Fixed bug that freeze some gameplay screens. New key button for aiming with sniper: say hi to V key button. Added performance mode explanation in settings. Fixed bug about changing weapon animation. Thanks a lot for all the support, soldiers. It's great to know you are enjoying this prototype. Don't forget to follow us for further news. 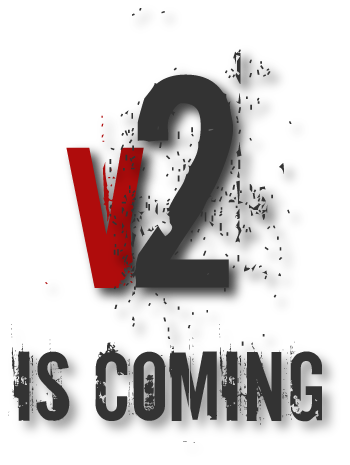 V2 is coming very, really very soon. Long gameplay life to project BlockchainZ!